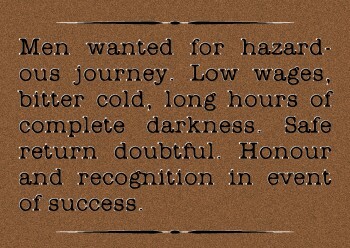 This “help wanted” ad has long been attributed to Ernest Shackleton, Antarctic explorer, and it has been claimed that he received over five thousand responses to it. Though it’s a brilliant bit of copy, it’s been fairly well established that it was just that; the ad never really ran and was written many years after Shackleton’s famed expedition. No matter, at the heart of it is a help wanted ad that spells out the real nature of a job. What are you telling prospective employees about your business and the type of employee you wish to hire? What we choose to write and the attention we pay to detail when writing an ad will determine the caliber of employee attracted to an interview. In fact, the interview process starts with the ad; and it’s not you determining the skill and potential of an employee, but the prospective employee determining if your business has the skill and potential for them to make a living working for you. Below is an ad that ran in my market recently and also very clearly lets a prospective employee know exactly what they’re in for if they sign on board. “Iceberg off the port bow!” Sirens and warning light should go off when you read the above ad. This bar is destined to interview the employees it deserves and I would hazard to guess that any bartender taking this job is in for “low wages, bitter cold, and long hours of complete darkness” and any chance for success is very “doubtful”. Posted on September 27, 2012 August 23, 2016 by Joseph DeLuca	This entry was posted in Bartenders, Hospitality, Managers, Operations and tagged Accountability, Bartenders, Hiring, Hospitality, Operations, Training. Bookmark the permalink.